One of the best moments for me as a Pompey fan was watching the team walk out at Wembley. I may have only gone to watch the Community Shield, but even so it was a thrill to see my team walking out on the pitch at Wembley. I could talk a small amount about the game (because to be honest, the actual match was fairly unremarkable) but what I actually want to talk about is the memory of the pre-game activities. This game was used as a platform to launch the FA’s “Respect” agenda. In a nutshell, I believe this was implemented so that football referees at all levels (from Sunday pub leagues to the Premiership) got more respect for the job they were doing. It was essentially an appeal from the FA to players to be more respectful (Hence the name, I see what they did there). So, I was there when the “Respect” agenda was launched and I remember thinking that it wasn’t such a bad idea. For too long, footballers (and managers to be fair) have been able to abuse and bully referees on the pitch if decisions didn’t go their way so I thought that this changing could only improve the game. What should have occurred at this time was the introduction of harsher penalties if the referee reported that he/she didn’t like the conduct of a player so that the FA’s message was clear – “we don’t want footballers abusing our refs, if they do then they will receive significant punishment”. This never occurred, so the agenda was somewhat of a joke really (I assume, I have no idea of its impact on the lower leagues). Generally speaking though, I do believe referees are deserving of more respect for the job they do – it is a thankless task really and it is always difficult. You can’t be 100% all the time and when you aren’t, you not only get footballers giving you grief, but possibly tens of thousands (depending where you are of course) calling you incompetent and a wanker. Just as a side point, it is amazing how this doesn’t happen in Rugby at all. The players there respect the referee (I’m not sure what the punishment system in Rugby is, but they are clearly doing something right). The purpose of this blog though isn’t about promoting referees all that much. I’ve done all the positive speaking I intend to do about them, but I feel the need to ask – should referees just be given respect? I’ve seen two games as of late which have made me wonder about whether referees deserve respect just because they are referees. One incident occurred in a game between Manchester United and Wigan and the other incident was actually the entire game of Portsmouth v Sheffield United (which I was at). I want to talk about Man Utd first though, but specifically, Wayne Rooney and Mark Clattenburg. In a nutshell, Rooney elbowed James McCarthy in an off the ball incident which should have resulted in a red card. However, there is some debate over whether the referee saw this incident. It appeared from the highlights it was only when he saw James McCarthy fall over that he stopped the match. 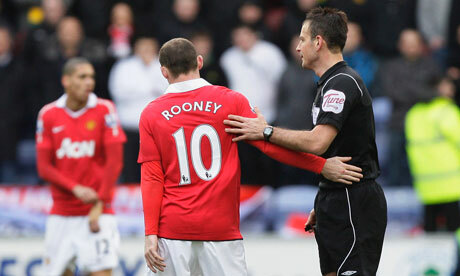 Now, if he genuinely didn’t see Rooney elbow McCarthy then there isn’t a great deal he can do at the exact moment. In fact, I’m pretty sure that even if he went back to his dressing room and watched a tape of it, he couldn’t send off Rooney at the start of the 2nd half (I’m not sure what the letter of the law states here, but to be honest if he went back at half time and saw the tape, and then saw the incident – he should be allowed to send Rooney off). Anyway, following the match everyone was waiting for the post-match referee report, expecting that Clattenburg would put something in the report which would allow the FA to charge Rooney for violent conduct – which should have happened. However, in a surprising moment, he didn’t. Perhaps he didn’t want to ruin the touching moment pictured above, but that is a shocking decision from Clattenburg. Man Utd are my premiership team when Portsmouth isn’t in it, but there is no doubt in my mind that Clattenburg in this instance boobed. Granted, the FA should be able to step in anyway and charge him, what with all the video evidence (Uhoh, dirty words in football) at their disposal, but the fact that Clattenburg didn’t write anything in his report which allows the FA to charge Rooney is appalling. In my eyes, Mark Clattenburg doesn’t deserve the respect which the FA claims he should get for being a referee. If anything, he should be removed from his position. I somehow doubt that’ll happen though. The second match I want to talk about is one from the weekend which I was at – Pompey v Sheffield United. Now, before I talk about the refereeing in this one, I would just like to say despite some shocking play, I am happy Pompey registered 6 wins and 6 clean sheets in a row. It is a shame that streak has now ended (for those not in the know, we lost 2-1 to Bristol City last night). Anyway, back to the game at hand. I noticed early on that Sheff Utd had players kicking the ball away after decisions had gone against them. This was from very early into the game and despite this being a bookable offence, I figured that the ref was saying to them that they should calm down or else they would get booked. However this continued throughout the entire game, which made me think that the ref was either incompetent or far too committed to letting the game flow. I approve of a referee that isn’t constantly stop-starting a game but there are rules to uphold and if needs be, cards to issue. This was one pet peeve. Another was the fact that whenever Portsmouth put balls forward, the Utd defenders would latch onto the arms/shirts/torsos of our front players constantly. Again, if this happens once and a ref misses it, then fair enough. But this happened so many times (including one incident RIGHT IN FRONT of the referee with Kanu, where Kanu actually had to wrestle himself free! no foul though...) that you have to question the referee. Constant mistakes are not acceptable in any job, why should it be acceptable for a referee and if it is why should I respect a referee who is making all these mistakes? It has been bought to my attention by Dave (you can read his blog – it’s up in the blogs list) that there hasn’t been one good referee this season in games he has seen. How can this be? Maybe it is something which can’t be changed – but the FA can’t expect me as a fan to respect the referee if there are no real standards for the referee’s to live up to, and if the players I am supporting are still free to abuse the referee with no fear of repercussion. Footballers shouldn’t be allowed to act this way, but as long as they are, referees will never be respected in this game. Furthermore, if a referee’s performance, no matter how poor, can’t be questioned, then I don’t see how these people deserve respect. My next gig was due to be Biohazard supported by Panic Cell at the Wedgewood rooms. I was really looking forward to this as Biohazard are pretty win and I love Panic Cell. However the gig has been cancelled for reasons best known to Biohazard so I now don’t have a gig until the beginning of April, when I will be making a journey to the capital of this country to watch Children of Bodom and Amon Amarth. Should be a good night and I’ve never been to the venue before (HMV Forum) so that should be good. I like going to new venues.